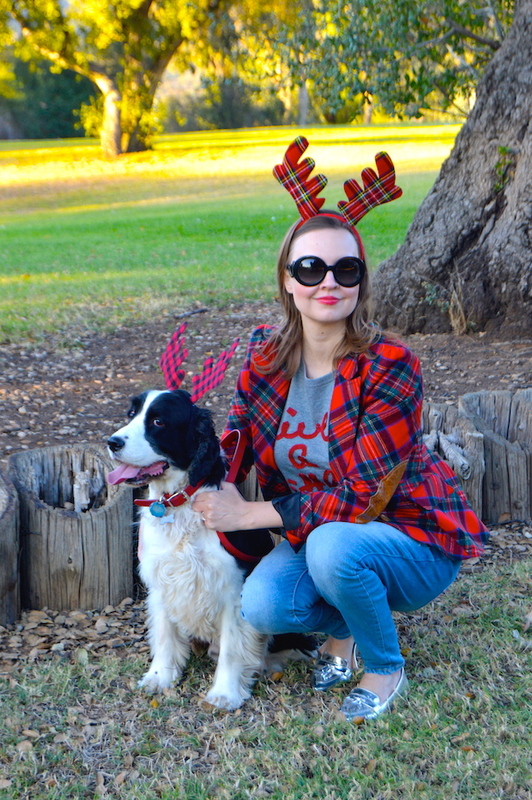 Hello Katie Girl: Merry Christmas from Katie and the Colonel! Merry Christmas from Katie and the Colonel! Merry Christmas everyone! 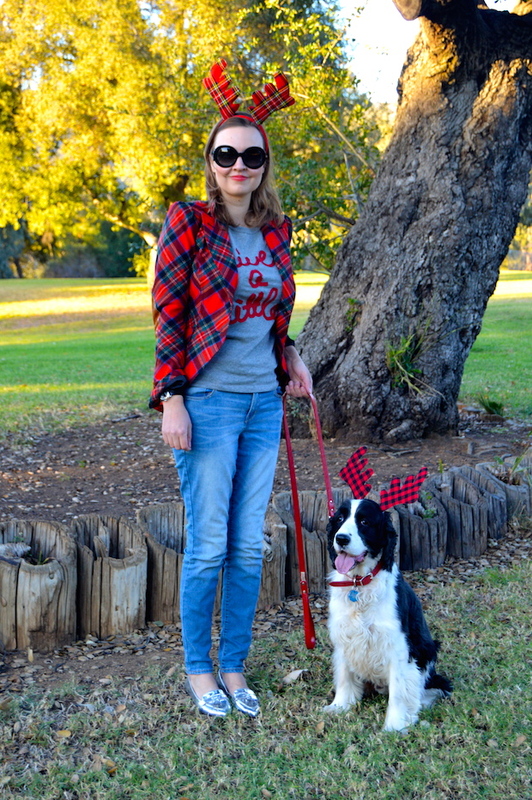 My T-shirt says "Live a Little" and I decided to do just that by taking some holiday pictures with my pup, Colonel William van Winkle in the park! Well, the problem was that William didn't feel like having his picture taken on this particular day (he's such a diva!) and instead wanted to play and chase things in the park! (I guess I can't really blame him for this because, after all, he is a dog and not a fashion blogger!) So that's why even though we took around 40 pictures, only three with both of us made it in the blog! I think I'm going to post the outtakes on Instagram, so stay tuned for some hilarity! Luckily, I did take some pictures sans William to fill up this post. 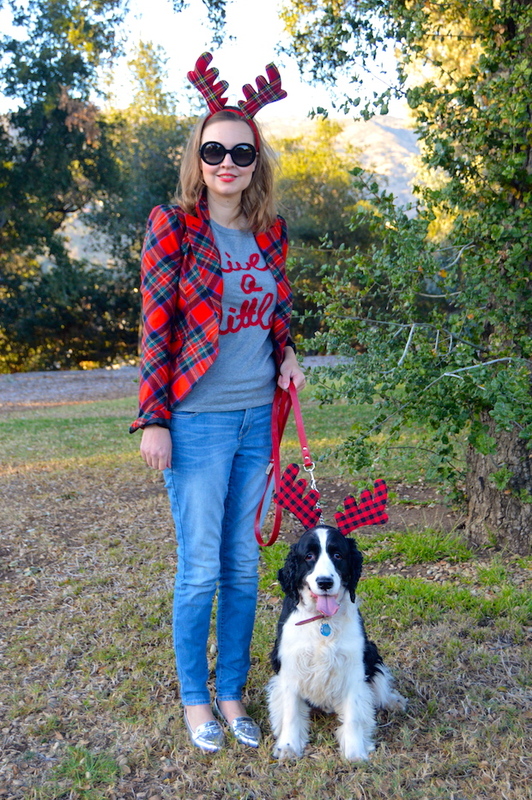 Plus, I really, really, really love this blazer and I kind of wanted to show it off! 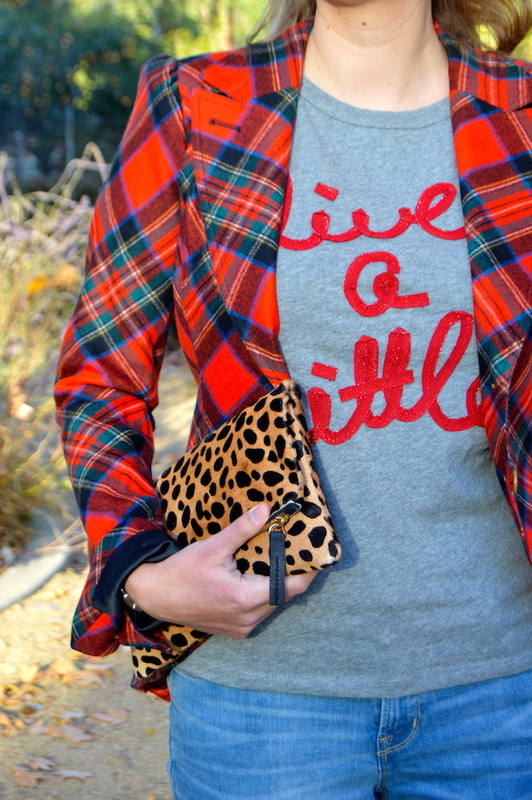 I wore this ensemble on the last day of school right before winter break and so while I'd normally dress the blazer up a bit more with a button down shirt, I decided to go the casual route with just my "Live a Little" tee. I'm glad I did because this was kind of my mantra for the day, as it was a little hectic. I just kept thinking that if I could get through it, I'll finally be able to "live a little" during winter break! I hope that no matter what you are doing for Christmas, it is filled with good times with family, friends, and maybe even crazy pets! Also, if you have a little vacation time, enjoy a well deserved break! I know I will, spending some quality time with my husband and, yes, even William! Reindeer Antlers- 99 cent Only Store!